"Rangoon" redirects here. For other uses, see Rangoon (disambiguation). 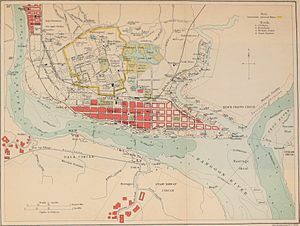 Yangon (Burmese: ရန်ကုန်မြို့ rankun mrui [jàɴɡòʊɴ mjo̰], lit. 'End of Strife'), formerly known as Rangoon, is the capital of the Yangon Region and commercial capital of Myanmar (also known as Burma). Yangon served as the administrative capital of Myanmar until 2006, when the military government relocated the administrative functions to the purpose-built city of Naypyidaw [nèpjìdɔ̀] in central Myanmar. With over 7 million people, Yangon is Myanmar's largest city and its most important commercial centre. Yangon boasts the largest number of colonial-era buildings in Southeast Asia, and has a unique colonial-era urban core that is remarkably intact. The colonial-era commercial core is centred around the Sule Pagoda, which is reputed to be over 2,000 years old. The city is also home to the gilded Shwedagon Pagoda – Myanmar's most sacred Buddhist pagoda. The mausoleum of the last Mughal Emperor is located in Yangon, where he had been exiled following the Indian Mutiny of 1857. 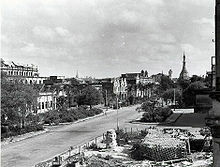 Yangon became the capital of the Union of Burma on 4 January 1948 when the country regained independence from the British Empire. Yangon has become much more indigenous Burmese in its ethnic make-up since independence. After independence, many South Asians and Anglo-Burmese left. Many more South Asians were forced to leave during the 1960s by Ne Win's xenophobic government. Nevertheless, sizeable South Asian and Chinese communities still exist in Yangon. The Anglo-Burmese have effectively disappeared, having left the country or intermarried with other Burmese groups. In May 2008, Cyclone Nargis hit Yangon. While the city had few human casualties, three-quarters of Yangon's industrial infrastructure was destroyed or damaged, with losses estimated at US$800 million. Older satellite towns such as Thaketa, North Okkalapa and South Okkalapa are lined mostly with one to two-story detached houses with access to the city's electricity grid. Newer satellite towns such as North Dagon and South Dagon are still essentially slums in a grid layout. The satellite towns—old or new—receive little or no municipal services. The largest and best maintained parks in Yangon are located around Shwedagon Pagoda. To the south-east of the gilded stupa is the most popular recreational area in the city – Kandawgyi Lake. The 150-acre (61-ha) lake is surrounded by the 110-acre (45-ha) Kandawgyi Nature Park, and the 69.25-acre (28-ha) Yangon Zoological Gardens, which consists of a zoo, an aquarium and an amusement park. West of the pagoda towards the former Hluttaw (Parliament) complex is the 130-acre (53-ha) People's Square and Park, (the former parading ground on important national days when Yangon was the capital.) A few miles north of the pagoda lies the 37-acre (15-ha) Inya Lake Park – a favourite hangout place of Yangon University students, and a well-known place of romance in Burmese popular culture. Yangon International Airport, located 12 miles (19 km) from the centre, is the country's main gateway for domestic and international air travel. The airport has three terminals, known as T1, T2 and T3 which is also known as Domestic. It has direct flights to regional cities in Asia, mainly: Doha, Dubai, Dhaka, Kolkata, Hanoi, Ho Chi Minh City, Hong Kong, Tokyo, Beijing, Phnom Penh, Seoul, Guangzhou, Taipei, Bangkok, Kuala Lumpur, Kunming and Singapore. Although domestic airlines offer service to about twenty domestic locations, most flights are to tourist destinations such as Bagan, Mandalay, Heho and Ngapali, and to the capital Naypyidaw. Yangon Central Railway Station is the main terminus of Myanmar Railways' 5,403-kilometre (3,357 mi) rail network whose reach covers Upper Myanmar (Naypyidaw, Mandalay, Shwebo), upcountry (Myitkyina), Shan hills (Taunggyi, Lashio) and the Taninthayi coast (Mawlamyine, Dawei). Yangon Circular Railway operates a 45.9-kilometre (28.5 mi) 39-station commuter rail network that connects Yangon's satellite towns. The system is heavily used by the local populace, selling about 150,000 tickets daily. The popularity of the commuter line has jumped since the government reduced petrol subsidies in August 2007. On 16 January 2017, city bus network system Yangon Bus Service (YBS) was created. Within Yangon city limits, it is illegal to drive trishaws, bicycles, and motorcycles. Since February 2010, pick-up truck bus lines have been forbidden to run in 6 townships of central Yangon, namely Latha, Lanmadaw, Pabedan, Kyauktada, Botahtaung and Pazundaung Townships. In May 2003, a ban on using car horns was implemented in six townships of Downtown Yangon to reduce noise pollution. In April 2004, the car horn ban was expanded to cover the entire city. Yangon's four main passenger jetties, all located on or near downtown waterfront, mainly serve local ferries across the river to Dala and Thanlyin, and regional ferries to the Irrawaddy delta. 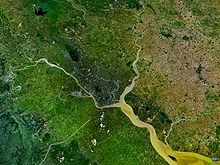 The 22-mile (35 km) Twante Canal was the quickest route from Yangon to the Irrawaddy delta until the 1990s when roads between Yangon and the Irrawaddy Division became usable year-round. While passenger ferries to the delta are still used, those to Upper Burma via the Irrawaddy river are now limited mostly to tourist river cruises. In 2017 October, a New Yangon Water Bus was launched. Yangon is the most populous city by far in Burma although estimates of the size of its population vary widely. All population figures are estimates since no official census has been conducted in Burma since 1983. A UN estimate puts the population as 4.35 million in 2010 but a 2009 US State Department estimate puts it at 5.5 million. The US State Department's estimate is probably closer to the real number since the UN number is a straight-line projection, and does not appear to take the expansion of city limits in the past two decades into account. 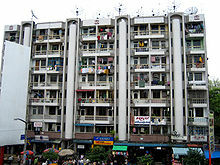 The city's population grew sharply after 1948 as many people (mainly, the indigenous Burmese) from other parts of the country moved into the newly built satellite towns of North Okkalapa, South Okkalapa, and Thaketa in the 1950s and East Dagon, North Dagon and South Dagon in the 1990s. Immigrants have founded their regional associations (such as Mandalay Association, Mawlamyaing Association, etc.) in Yangon for networking purposes. The government's decision to move the nation's administrative capital to Naypyidaw has drained an unknown number of civil servants away from Yangon. Yangon is the most ethnically diverse city in the country. While Indians formed the slight majority prior to World War II, today, the majority of the population is of Bamar (Burman) descent. Large communities of Indian/Bangladeshi Burmese and the Chinese Burmese exist especially in the traditional downtown neighbourhoods. A large number of Rakhine and Karen also live in the city. The primary religions practised in Yangon are Buddhism, Islam, Christianity and Hinduism. Shwedagon Pagoda is a famous religious landmark in the city. Most television channels in the country are broadcast from Yangon. TV Myanmar and Myawaddy TV are the two main channels, providing Burmese-language news and entertainment programmes. Other special interest channels are MWD-1 and MWD-2, MRTV-3, the English-language channel that targets overseas audiences via satellite and via Internet, MRTV-4 and Channel 7 are with a focus on non-formal education programs and movies, and Movie 5, a pay-TV channel specialising in broadcasting foreign movies. Yangon has three radio stations. Myanmar Radio National Service is the national radio service and broadcasts mostly in Burmese (and in English during specific times.) Pop culture oriented Yangon City FM and Mandalay City FM radio stations specialise in Burmese and English pop music, entertainment programs, live celebrity interviews, etc. New radio channels such as Shwe FM and Pyinsawaddy FM can also be tuned with the city area. Nearly all print media and industries are based out of Yangon. All three national newspapers – two Burmese language dailies Myanma Alin (မြန်မာ့အလင်း) and Kyemon (ကြေးမုံ), and the English language The New Light of Myanmar – are published by the government. Semi-governmental The Myanmar Times weekly, published in Burmese and in English, is mainly geared for Yangon's expatriate community. Over twenty special interest journals and magazines covering sports, fashion, finance, crime, literature (but never politics) vie for the readership of the general populace. Access to foreign media is extremely difficult. Satellite television in Yangon, and in Burma, is very expensive as the government imposes an annual registration fee of one million kyats. Certain foreign newspapers and periodicals such as the Straits Times can be found only in a few (mostly downtown) bookstores. Internet access in Yangon, which has the best telecommunication infrastructure in the country, is slow and erratic at best, and the Burmese government implements one of the world's most restrictive regimes of Internet control. International text messaging and voice messaging was permitted only in August 2008. As the city has the best sporting facilities in the country, most national-level annual sporting tournaments such as track and field, football, volleyball, tennis and swimming are held in Yangon. The 40,000-seat Aung San Stadium and the 32,000-seat Thuwunna Stadium are the main venues for the highly popular annual State and Division football tournament. Until April 2009, the now defunct Myanmar Premier League, consisted of 16 Yangon-based clubs, played all its matches in Yangon stadiums, and attracted little interest from the general public or commercial success despite the enormous popularity of football in Burma. Most Yangonites prefer watching European football on satellite TV. Teams such as Manchester United, Liverpool, Chelsea, Real Madrid, Barcelona, Bayern Munich and Manchester City are among the favourite European teams among the Yangonites. It remains to be seen whether the Myanmar National League, the country's first professional football league, and its Yangon-based club Yangon United FC will attract a sufficient following in the country's most important media market. Yangon has a growing population of skateboarders, as documented in the films Altered Focus: Burma and Youth of Yangon. German non-profit organisation Make Life Skate Life has received permission from the Yangon City Development Committee to construct a concrete skatepark at Thakin Mya park in downtown, and plans to complete the park in November 2015. A street market in Downtown Yangon selling produce. Manufacturing accounts for a sizeable share of employment. At least 14 light industrial zones ring Yangon, directly employing over 150,000 workers in 4,300 factories in early 2010. The city is the centre of country's garment industry which exported US$292 million in 2008/9 fiscal year. More than 80 percent of factory workers in Yangon work on a day-to-day basis. Most are young women between 15 and 27 years of age who come from the countryside in search of a better life. The manufacturing sector suffers from both structural problems (e.g. chronic power shortages) and political problems (e.g. economic sanctions). In 2008, Yangon's 2500 factories alone needed about 120 MW of power; yet, the entire city received only about 250 MW of the 530 MW needed. Chronic power shortages limit the factories' operating hours between 8 am and 6 pm. The general state of health care in Yangon is poor. According to a 2007 estimate, the military government spends 0.4% of the national budget on health care, and 40% to 60% on defence. By the government's own figures, it spends 849 kyats (US$0.85) per person. Although health care is nominally free, in reality, patients have to pay for medicine and treatment, even in public clinics and hospitals. Public hospitals including the flagship Yangon General Hospital lack many of the basic facilities and equipment. Wealthier Yangonites still have access to country's best medical facilities and internationally qualified doctors. Only Yangon and Mandalay have any sizeable number of doctors left as many Burmese doctors have emigrated. The well-to-do go to private clinics or hospitals like Pun Hlaing International Hospital and Bahosi Medical Clinic. Medical malpractice is widespread, even in private clinics and hospitals that serve the well-to-do. In 2009 and 2010, a spate of high-profile deaths brought out the severity of the problem, even for the relatively well off Yangonites. The wealthy do not rely on domestic hospitals and travel abroad, usually Bangkok or Singapore, for treatment. ^ a b c d "Third Regional EST Forum: Presentation of Myanmar" (PDF). Singapore: Ministry of Transport, Myanmar. 17–19 March 2008. ^ Census Report. The 2014 Myanmar Population and Housing Census. 2. Naypyitaw: Ministry of Immigration and Population. May 2015. p. 31. ^ "Burma's new capital stages parade". BBC News. 27 March 2006. Retrieved 3 August 2006. ^ a b Martin, Steven (30 March 2004). "Burma maintains bygone buildings". BBC News. Retrieved 22 May 2006. ^ "As Myanmar Modernizes, Architectural Gems Are Endangered". NPR. 4 June 2014. Retrieved 8 April 2017. ^ De Thabrew, W. Vivian (11 March 2014). Buddhist Monuments And Temples of Myanmar And Thailand. AuthorHouse. ISBN 9781491896228. Retrieved 8 April 2017. ^ "Rapid migration and lack of cheap housing fuels Yangon slum growth". Myanmar Now. 27 February 2016. Retrieved 8 April 2017. ^ a b c Kyaw Kyaw (2006). Frauke Krass; Hartmut Gaese; Mi Mi Kyi (eds.). Megacity yangon: transformation processes and modern developments. Berlin: Lit Verlag. pp. 333–334. ISBN 978-3-8258-0042-0. ^ "BBC NEWS | Asia-Pacific | Burma maintains bygone buildings". BBC. 30 March 2004. Retrieved 27 July 2017. ^ "Moulmein, first British capital of Myanmar, back on the tourist map". The Hindu. Retrieved 27 July 2017. ^ a b "Yangon Summary Review and Analysis". Bookrags.com. 17 October 2005. Retrieved 17 April 2010. ^ a b Falconer, John; et al. (2001). Burmese Design & Architecture. Hong Kong: Periplus. ISBN 978-962-593-882-0. ^ a b c d Tin Maung Maung Than (1993). Indian Communities in south-east Asia – Some Aspects of Indians in Rangoon. Institute of south-east Asian Studies. pp. 585–587. ISBN 9789812304186. ^ "Background Note: Burma". Bureau of East Asian and Pacific Affairs, US Department of State. Retrieved 1 January 2009. ^ Edward Blair (1 May 2006). "Beyond Rangoon". The Irrawaddy. ^ "Special Report". 4 November 2001. ^ Zaw Htet. "Pioneering FMI City 'the best in Yangon'". The Myanmar Times. ^ Kyi Kyi Hla (1 February 2001). "Ngamoeyeik Bridge". ^ Ye Lwin (14 July 2008). "Long road back for industrial recovery". The Myanmar Times. ^ "World Weather Information Service – Yangon". World Meteorological Organization. Archived from the original on 19 December 2016. Retrieved 8 May 2012. ^ "Klimatafel von Yangon (Rangun) / Myanmar (Birma)" (PDF). Baseline climate means (1961–1990) from stations all over the world (in German). Deutscher Wetterdienst. Retrieved 26 April 2018. ^ Cappelen, John; Jensen, Jens. "Myanmar – Rangoon" (PDF). Climate Data for Selected Stations (1931–1960) (in Danish). Danish Meteorological Institute. p. 189. Archived from the original (PDF) on 27 April 2013. Retrieved 23 February 2013. 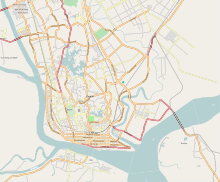 ^ "Normals Data: YANGON - MYANMAR Latitude: 16.77°N Longitude: 96.17°E Height: 14 (m)". Japan Meteorological Agency. Archived from the original on 13 January 2019. Retrieved 13 January 2019. ^ May Thanda Win (16 July 2006). "The Future of Yangon". The Myanmar Times. Archived from the original on 21 November 2008. Retrieved 5 December 2018. ^ Zin Nwe Myint (2006). Frauke Krass; Hartmut Gaese; Mi Mi Kyi (eds.). Megacity yangon: transformation processes and modern developments. Berlin: Lit Verlag. p. 264. ISBN 978-3-8258-0042-0. ^ Tom Wright (23 January 2009). "Asia's Lost Treasure Trove". WSJ Weekend Journal. ^ Htar Htar Khin (15 December 2008). "Demand for downtown's golden oldies still strong". The Myanmar Times. Archived from the original on 14 February 2012. ^ Kennedy, Phoebe (20 February 2011). "Colonial past could be the saving of Rangoon". The Independent. Retrieved 10 March 2012. ^ a b Robinson, Gwen (9 March 2012). "Myanmar pushes to save colonial buildings". Financial Times. Retrieved 10 March 2012. ^ "City living: condos vs apartments". The Myanmar Times. 1 September 2007. Archived from the original on 20 July 2008. Retrieved 12 September 2008. ^ Yi Yi Htwe (10 March 2008). "Lift regulation changed". The Myanmar Times. Archived from the original on 16 December 2010. Retrieved 1 January 2009. ^ "Kandawgyi Garden". Retrieved 21 December 2006. ^ "History of Zoological Gardens (Yangon)". Archived from the original on 2 August 2008. Retrieved 27 September 2008. ^ "Nation's Capital Yangon". Retrieved 9 October 2008. ^ "Yangon". Asian Network of Major Cities 21. Archived from the original on 20 June 2006. Retrieved 13 August 2006. ^ a b c "Discussion on a 30-Year Development Plan for Yangon". Weekly Eleven (in Burmese). 18 December 2011. ^ "Getting Around Yangon". Myanmar's Net. Retrieved 14 October 2008. ^ Aye Nyein Win (16 January 2017). "New day dawns for Yangon bus system". Myanmar Times. Retrieved 16 January 2017. ^ Thomas Kean (2 June 2008). "Clash of the titans on streets of Yangon". The Myanmar Times. Archived from the original on 4 January 2010. Retrieved 2 June 2008. ^ "Burma Makes Road Switch". The New York Times. 7 December 1970. Retrieved 22 May 2010. ^ Nay Nwe Moe Aung (24 February 2010). "Authorities ban light truck buses in downtown areas". Myanmar Times. Archived from the original on 16 July 2011. Retrieved 18 August 2011. ^ a b Shwe Yinn Mar Oo (10 December 2007). "Vehicle horn penalties increased". Myanmar Times. Retrieved 18 August 2011. ^ "Yangon – Getting there and around". Lonely Planet. Archived from the original on 20 January 2010. Retrieved 26 July 2009. ^ a b "United Nations World Urbanization Prospects, 2007 revision". United Nations. Archived from the original on 23 December 2009. Retrieved 27 April 2010. ^ "Background note: Burma". US Department of State. Retrieved 6 March 2010. ^ Kyaw Soe Linn & Phyo Wai Kyaw (14 May 2007). "Language training centres open doors to new worlds". The Myanmar Times. Archived from the original on 20 July 2008. Retrieved 1 January 2009. ^ a b Yeni (1 March 2008). "Burma: The Censored Land". The Irrawaddy. Archived from the original on 11 March 2008. Retrieved 20 March 2008. ^ Kyaw Hsu Mon (3 August 2008). "Digital television take-up slower than expected". The Myanmar Times. Archived from the original on 30 April 2011. Retrieved 8 August 2008. ^ a b "Internet Filtering in Burma in 2005: A Country Study". 1 October 2005. Retrieved 29 August 2008. ^ a b Min Lwin (21 August 2008). "International Text Messaging Approved in Burma". The Irrawaddy. Archived from the original on 11 August 2010. Retrieved 30 August 2008. ^ "Mobile phones in Myanmar increase to over 200,000 in 2007". 3 April 2008. Archived from the original on 3 July 2009. Retrieved 1 September 2009. ^ "Myanmar (Burma) – Telecoms, Mobile & Internet". Dublin: Research and Markets. 19 July 2010. ^ Wai-Yan Phyo Oo & Saw Pyayzon (30 July 2010). "State of Internet Usage in Myanmar". Bi-Weekly Eleven (in Burmese). 3 (18). ^ Aye Sabae Phyu (14 July 2008). "Rentals brisk in lead up to Waso". The Myanmar Times. Archived from the original on 30 April 2011. Retrieved 6 July 2008. ^ Claudio Marana & Nin Cheun (17 June 2012). "Myanmar new 10,000-kyat note confirmed". Bank Note News. ^ Zaw Htet (1 August 2005). "Myanmar edges towards pro football". The Myanmar Times. Archived from the original on 14 May 2011. Retrieved 27 November 2018. ^ Kyaw Hsu Mon & Yadana Htun (7 November 2011). "Yangon Region govt facing K22b budget black hole". The Myanmar Times. Archived from the original on 17 June 2013. Retrieved 9 March 2012. ^ Zaw Htet & May Thanda Win (4 September 2006). "Market reforms lead to Bayintnaung boom". The Myanmar Times. Archived from the original on 29 January 2009. Retrieved 27 November 2018. ^ Nay Nwe Moe Aung; Moh Moh Thaw (20 June 2011). "Vendors belong in markets, says YCDC". Myanmar Times. Archived from the original on 2 October 2011. Retrieved 18 August 2011. ^ Myo Myo (9 November 2009). "Mayor reiterates bag ban". Myanmar Times. Archived from the original on 12 June 2012. Retrieved 18 August 2011. ^ "Industrial Zones". Ministry of Industry 2, Myanmar. Archived from the original on 8 September 2008. Retrieved 25 December 2008. ^ Wai-Yan Phyo Oo (19 February 2010). "Yangon Division Industrial Zones". Bi-Weekly Eleven (in Burmese). 2 (48). Archived from the original on 11 September 2014. Retrieved 27 June 2014. ^ Ba Kaung (10 February 2010). "Rangoon Workers End Strike". The Irrawaddy. Archived from the original on 6 May 2010. Retrieved 27 February 2010. ^ Ye Lwin (26 May 2008). "Hlaing Tharyar IZ rebuilding underway". The Myanmar Times. Archived from the original on 30 April 2011. Retrieved 2 June 2008. ^ Ye Lwin (26 March 2007). "Industrial zones to run at night". The Myanmar Times. ^ Zaw Htet (3 September 2007). "Property market continues to recover". The Myanmar Times. Archived from the original on 28 August 2008. Retrieved 23 April 2008. ^ Htar Htar Khin (February 2010). "High-rise building slowing down". The Myanmar Times. 26 (9). ^ "Tourism decline in Burma in 2008". Weekly Eleven Journal. Burma Digest. 27 November 2008. Archived from the original on 9 May 2010. ^ Colin Hinshelwood (9 February 2012). "Rangoon Hotels Struggle to Meet Tourist Demand". The Irrawaddy. Archived from the original on 9 February 2012. Retrieved 10 January 2012. ^ "New hotel zones planned near Yangon". Weekly Eleven. 14 October 2012. Archived from the original on 22 November 2012. Retrieved 22 October 2012. ^ a b "Are 'Smart' Sanctions Making Burmese Dumber?". The Irrawaddy. 16 July 2010. Archived from the original on 21 July 2010. Retrieved 3 June 2010. ^ "Yangon Division Produces More Distinction Winners". Bi-Weekly Eleven News (in Burmese). 28 June 2010. ^ Aye Thawda Thit (28 March 2008). "Myanmar students choosing Australian and Singapore unis". The Myanmar Times. Archived from the original on 20 July 2008. Retrieved 23 April 2008. ^ Sandra Davie (13 October 2008). "I see no future for my two sons in Myanmar". The Straits Times. Singapore. ^ Minh Zaw (28 March 2008). "HR key to development". The Myanmar Times. Archived from the original on 20 July 2008. Retrieved 23 April 2008. ^ a b Arkar Moe (8 January 2010). "Another Medical Malpractice Death in Rangoon". The Irrawaddy. Archived from the original on 12 January 2010. Retrieved 18 December 2009. ^ Thein Win Nyo (11 June 2007). "Medical tourism gives patients options". The Myanmar Times. Archived from the original on 20 July 2008. Retrieved 1 January 2009. ^ Business (10 November 2012). "Yangon, Turin to establish connectivity as sister cities". Myanmar Update. Retrieved 3 August 2016. ^ "Experience the wonders of Yangon at the Meet YANGON festival!". Creative Fukuoka. Creative Lab Fukuoka, Fukuoka City. 7 September 2017. Retrieved 13 October 2017. ^ "Quezon City, Yangon ink sister city deal". Manila Bulletin. Retrieved 7 February 2017. 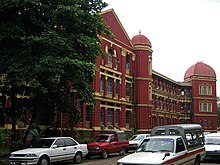 Wikimedia Commons has media related to Yangon. Wikisource has the text of the 1911 Encyclopædia Britannica article Rangoon.